Early literacy intervention for children with speech and language delays and/or physical disabilities is the cornerstone for future progress and success in many facets of life. Unfortunately, teaching literacy to students with severe cognitive or physical disabilities has been largely ignored in years past. Due to the children’s lack of language-based joint interactions and access to expressive language opportunities, many teachers and professionals were under the impression that these children were not able to learn literacy skills along with their typical peers. They may struggle with understanding teachers and peers, early learning and play skills, misunderstand social cues, and have difficulty with academic screenings and assessments. Augmentative and Alternative Communication (AAC) is a way to support and enhance children’s communication, language, and literacy development. AAC includes all forms of communication (other than oral speech) used to express thoughts, needs, wants and ideas. This includes everything from facial expressions or gestures to symbols and pictures to writing. Children with severe speech or language problems rely on AAC to supplement or replace speech that is not functional. Special augmentative aids, such as picture and symbol communication boards and electronic devices, are available to help children express their thoughts and ideas and supports the learning of early literacy skills. 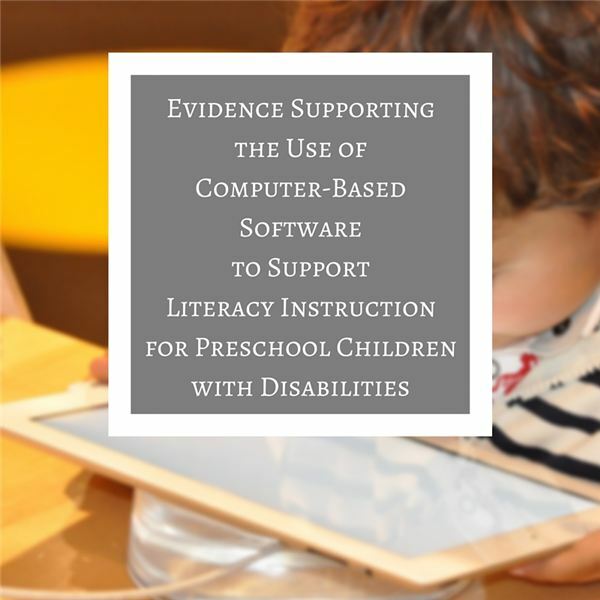 Research supports the use of assistive technology (AT) to assist young children with learning early literacy skills. This review will summarize the information provided in various journal articles and present a conclusion of their findings with regard to the effectiveness of AT in supporting literacy education in young children. Although all articles discussed the use of AT in preschool or kindergarten settings to support and enhance literacy, their methods were varied across classroom settings. Some described the use of computer-based software as a formal addition to the curriculum, while others used it as a support system in a natural setting, rather than using it in a structured manner. All articles reviewed addressed children with disabilities, some including specific diagnoses including autism, communication/speech and language disorders, cerebral palsy, cognitive delays, Down syndrome, and visual impairment and motor delays. Some of the articles reviewed described specific evidence-based outcomes, interventions and programs for use with children with disabilities. The leading outcome related to literacy development in several articles was gains in both the use of literacy and technology. This included an increase in time spent in self-selected literacy activities during unstructured free time and an increase in amount and types of writing produced in daily routines. Another positive outcome measured was the increase of word and letter recognition in both preschool and kindergarten students. Other areas of growth include increased interaction with books, communication and interaction with peers and adults and the sounding out of letters and words. Most articles discussed ways in which new technologies in media are developing literacy awareness and can no longer be viewed as passive activities with no benefits. Other areas of improvement include phonological awareness skills, directionality, letter-sound correspondences, blending, phoneme and segmentation, early decoding, early writing, and sight word recognition. Reading comprehension skills developed include sequencing, retelling, predicting and shared reading. There is a scarcity of research in the area of AT in promoting literacy in young children with disabilities. Many articles stressed the importance of continued work to increase evidence toward the use of AT to decrease the likelihood that children with disabilities will fall behind their same-aged peers by the time they reach elementary school. In addition, appropriate training, education and awareness for educators and parents must be improved. An increase of evidence is still needed to further support the use of AT in promoting literacy in young children with disabilities. Technology and literacy continue to intermingle and are interdependent. The role of technology needs to be further defined and controlled trials completed to allow more publishing of evidence to be released to continue to justify the continued use of AT in the classroom. Boone, R. (1996). Hypermedia Pre-Reading Lessons: Learner Centered Software for Kindergarten. Journal of Computing In Childhood Education: 7:36-39. Parette, Hp., Hourcade, J., Dinelli, J. & Boeckmann, N. (2009). Using Clicker 5 to Enhance Emergent Literacy in Young Learners. Early Childhood Education Journal. 36:355-363. Light, J. & Drager, K. (2007). AAC Technologies for Young Children with Complex Communication Needs: State of the Science and Future Research Directions. Augmentative and Alternative Communication. 23:204-216. Koppenhaver, D. & Erickson, K. (2003). Natural Emergent Literacy Supports For Preschoolers With Autism And Severe Communication Impairments. Top Language Disorders. 23:283-292.